There is no doubt that social workers belong to a noble and worthwhile profession. It is a field that requires those involved in it to carry out tasks that uplift societies suffering from a variety of social problems. It is also a discipline that constantly promotes the development and growth of various societies and community groups. So, it would seem you have decided on social work as your field of study and, in doing so, your efforts should be appreciated. Later in your career, it is most likely you will be involved in providing assistance to people who are deprived. However, before you achieve your dreams of helping to advance society, there is a tough task ahead of you, which is writing a dissertation on social work. Are these problems that you are facing? 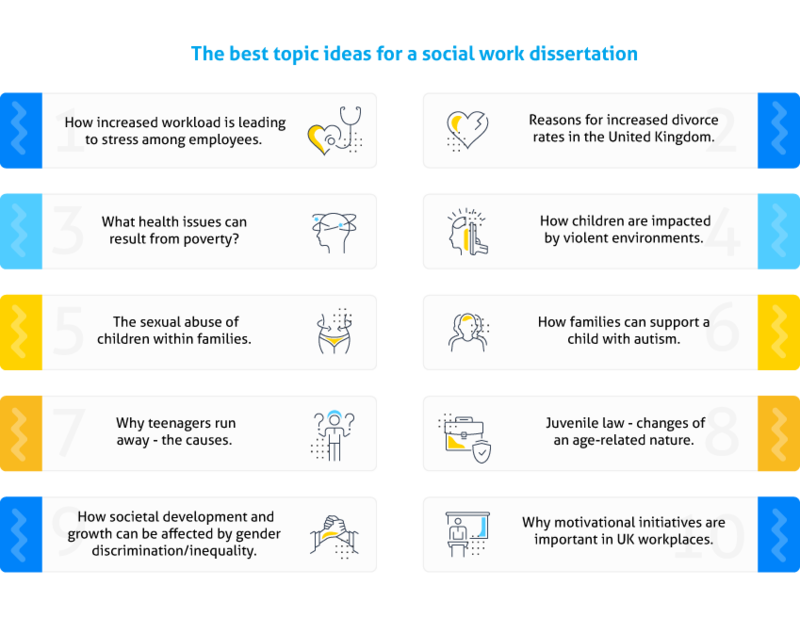 If so, you can now leave your worries behind because here we provide you with a host of great topic ideas for a dissertation on social work. Looking for Social Work Dissertation Ideas: Where to Begin? Postgraduate papers, especially a dissertation, can put students through hell if they choose the topic they are not interested in. However, have you ever thought that there is a set of methods that can help you come up with a good topic that will make the research process interesting? While in many cases the topic of your research will be defined by either your professor or will be a logical continuation of your previous research, sometimes you can get lucky enough to choose the topic yourself. Choose modern and relevant literature for any ideas or questions. Often, academic articles include references and questions that need further research. Browse through book reviews to eliminate important aspects and unresolved matters and compare them against other books to identify knowledge gaps. Visit subject related forums and discussion boards. In many cases, scholar discussions online are rather successful in identifying questions for research and debate. Search for websites that offer scholarships. Different NGOs and companies can invest in your research if you pick the topic they are interested in. Generally, such announcements are accompanied by a list of topics. Be open to change and embrace the unknown. Some professors recommend having a list of three to five topics to choose from in order to have a backup plan. Prepare for a test drive. If you can decide between the topics, pretend you have to research each of them and spend a day or two doing so. You will inevitably grow on a topic that you believe to be the right one. Instead of ‘Chances of winning in a casino’ fo for ‘Mathematical and statistical probability of winning in gambling are not well-researched’. Work with what you have. Sometimes, in our desire to do the best, we dream of unrealistic things. In the academic world, you have to be reasonable and settle down with what you have. We hope the above list will not just provide you with some great ideas but show you that our writing experts are extremely knowledgeable in the field of social work. As well as topics, they can even provide examples, which we are sure will help you decide to accept our assistance. Our company would be delighted to be your helper on your way to obtaining the highest grades for your dissertation and becoming a first-class social worker. Edublogging for college and university personnel: promoting higher education via social media. Gamification of the learning process for museums, archives, and libraries. Classifying drinking styles: reasons for college and university drinking problems. As you can see, choosing a dissertation topic for both undergraduate and postgraduate student is a challenging task. You may feel lost, but always remember why you have started. How Can You Narrow down Social Work Dissertation Topics? Virtually any student struggles with selecting a specific topic, be it an essay, research project or dissertation. However, it is important to choose a narrow and distinct topic to be able to research, write and argue properly. There are three steps to take while narrowing down your dissertation topic. Make some words and collocations clear-cut. For example, try switching generic ‘people’ with ‘college students’. Strive for a complete and complex sentence. This will help you narrow down the subject. Be precise, yet leave the chance for debate. Do not use indisputable truth as your dissertation topic. We understand that these tips might seem boring, but a well-designed topic can turn into exiting research. First of all, understand what you are interested in and how it correlates with your field of study. Next, do some research and understand what has been studied and published before you. And last, make your topic precise and unambiguous. If nothing helps and you cannot find a topic you are interested in, try searching the Internet for some ideas and inspiration. The final step involves revising your paper again and delivering it to you according to the agreed deadline. It is important to remember that we do not treat your dissertation as just another document. In fact, we do everything in our power to ensure you are completely satisfied with the help you get from our dissertation writing service. If you are looking for dissertation topic help, along with further writing assistance, let experts from Topthesis.com help you out. We have writers who have Ph.D. degrees in over 40 academic fields and have great experience in academic writing. Why should you choose us? You will be able to communicate directly with your writer and have full control over every step of the process. You can order progressive delivery and receive your dissertation in parts. For large orders over 20 pages, we offer 30 days of free revision, making it convenient for you to revise the completed paper. You can request a free plagiarism report along with your dissertation to be sure that your paper is authentic. You can receive support and assistance at day and night via live-chat, phone or through the website. Do not blow your chance for a great paper, order immediately!